I believe I’m right in saying that Matt Layden, known as Wizard, has completed nine races organized under the banner of Water Tribe, either in the Everglades Challenge Race or the Ultimate Florida Challenge Race. He has performed well in a variety of his own-designed and home-built craft. His sailing vessels of note are ‘Paradox’, ‘Enigma’ and his latest boat, ‘Elusion’. I was so fascinated with ‘Paradox’, that I built my own. She truly was a very fine little beach cruiser, capable of sailing in shallow water where other craft would find it impossible. This was in part due to chine runners either side of the sharpie hull and the efficient hydrodynamic shape of the hull. When running downwind she was a stable boat because of her flat bottom and buoyant bilges. Matt incorporated a cleverly designed roller-reefing, standing lugsail, which was rigged on a short, freestanding mast. 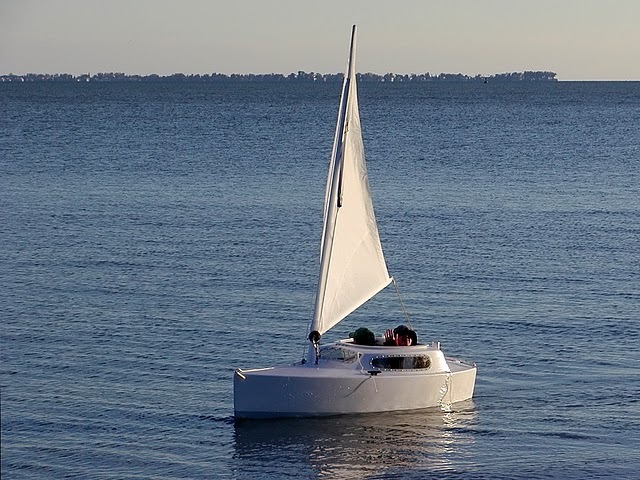 He has put a lot of thought into the design of his sailing boats with a view to reducing surface friction, both below and above the waterline. He has designed them as displacement boats, rather than light-displacement boats. Drag is an element that reduces forward motion, and Matt really appreciates the importance of minimizing its effect. Rather than relying on waterline length to achieve speed, Matt, has concentrated on being super-efficient at reducing friction, e.g., his boats have no standing rigging and few external halyards, downhauls etc. On his own boats he avoids using topping lifts. ‘Paradox’, ‘Enigma’, and ‘Elusion’ all look similar, as if they are sisters – ‘Paradox’ the eldest and ‘Elusion’ the youngest. Matt relies on ballasting his boats to bring them to their designed waterlines. Paradox has water and lead ballast; Enigma has bagged sand, plus her cruising gear; ‘Elusion’ has cruising gear and water, plus her crew. Paradox is the largest of the three, and ‘Elusion’ at 9 feet by 38 inches is by far the smallest. To my mind, the most remarkable is the very tiny ‘Elusion’. 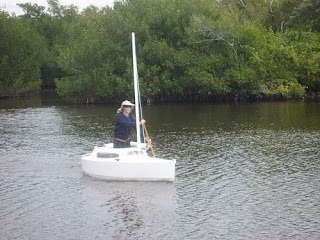 Matt endorses his confidence in the boat by entering her in the Water Tribe Ultimate Florida Challenge Race. Here is a man who has competed on these waters for many years; hence he knows them like the back of hand. He is fully aware of possible scenarios that could arise – principally caused by the effect of the wind on the shallow waters around the coast of Florida. He knows where he can seek shelter if need be. Matt’s preference is for extreme minimalism, and he is a guy who enjoys the challenge of overcoming what for most of us would be perceived as goals that are impossible to achieve. As I put this article together he is currently the leader in Class 4, which is for Small Sailboats. As a tribute to him for his special contribution to the small sailboat community, I am pleased to have this opportunity of thanking him, and wishing him good fortune as he continues with the Race. Whether he wins or not, is irrelevant, because I feel sure his aim is to compete to the very best of his ability and strength. Whatever happens, he is already a true winner. Well done, Matt! Bill, this is a great summation of Matt's particular genius and introduction of the new boat, which I wasn't aware of. Thanks so much for this, I may be writing about this as well, very cool boat! This little boat would make a great kit boat. Matt does not capitalize on his genius - he's just not interested. Getting plans for his boats, apart from Paradox, is not possible. Well, I'll be looking forward to your article. Thanks Pete, That's a super clip of Matt coming to the beach. I wish he would make plans available for elusion. You guys need to understand that Elusion is experimental. Apparently Matt is satisfied enough with Paradox to release the plans. 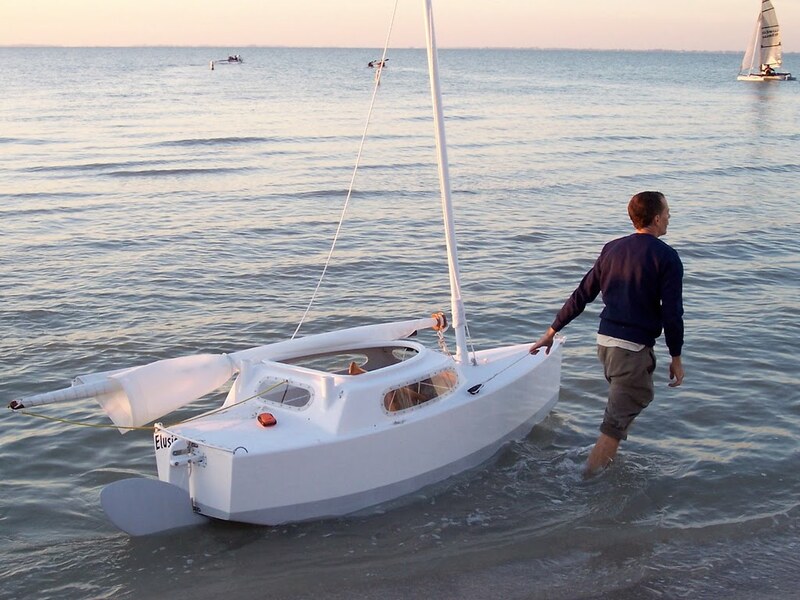 Elusion is a remarkable boat, but this doesn't mean that it couldn't get a lot of sailors into trouble. Some of its success is due to his excellent seamanship and knowledge of the EC course. 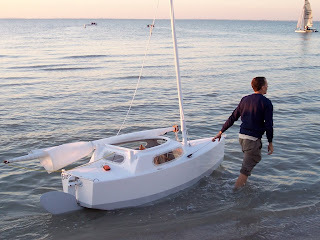 As an experiment in minimalism, this boat is remarkable. Paradox is practical, but not cartoppable for many people. 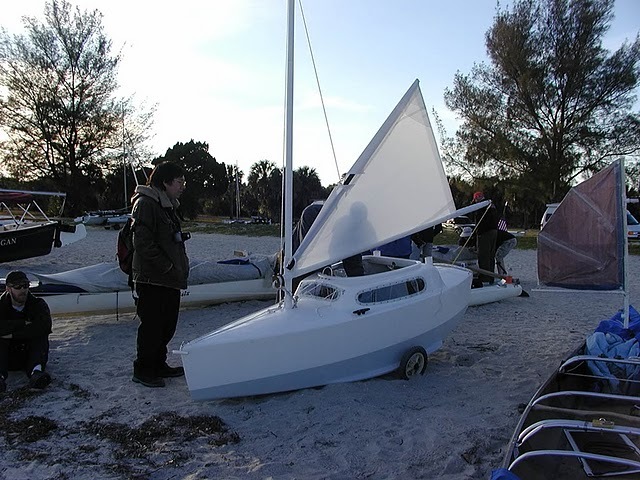 I wonder how many of you have ever been in the water in a boat of Elusion's size range.